Kelvin Gastelum and Israel Adesanya squared off for the interim middleweight championship in the co-headliner of last night’s UFC 236 event in Atlanta. The fight exceeded expectations, as Gastelum and Adesanya proceeded to throw down for the better part of twenty-five minutes, much to the pleasure of fight fans in attendance and watching around the world. Gastelum was able to drop Adesanya in the opening round, but “Stylebender” slowly turned the tide in rounds two and three by landing several significant strikes. After a back and forth round four, which once again saw Kelvin Gastelum hurt Israel Adesanya with big punches, it appeared we were knotted up going into the fifth and final round. Israel Adesanya proved to be the fresher fighter in round five and went on to batter ‘KG’ for the better parts of the final five minutes while nearly ending the fight. In the end, the judges in attendance awarded ‘Stylender’ with a unanimous decision victory over Kelvin Gastelum (See the highlights here). 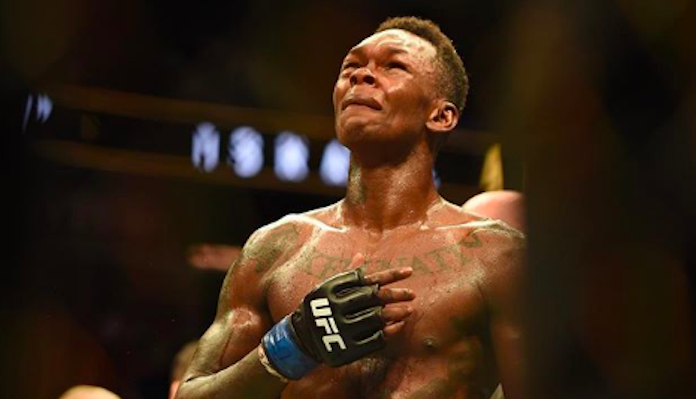 With the victory, Israel Adesanya is now the promotions interim middleweight champ and will fight Robert Whittaker in a title unification bout later this year. As for Kelvin Gastelum, after losing his high profile title bout, in a fight many are proclaiming as ‘Fight of the year’, the middleweight standout took to Twitter with the following statement for his fans and supporters. Who would you like to see Kelvin Gastelum fight in his next UFC octagon appearance when he is healthy and ready to return? Sound off in the comments section Penn Nation! The post Kelvin Gastelum issues statement following UFC 236 title loss to Israel Adesanya appeared first on | BJPenn.com.